I played with pastel-colored beads and wooden blocks with ridges, babyhood toys. 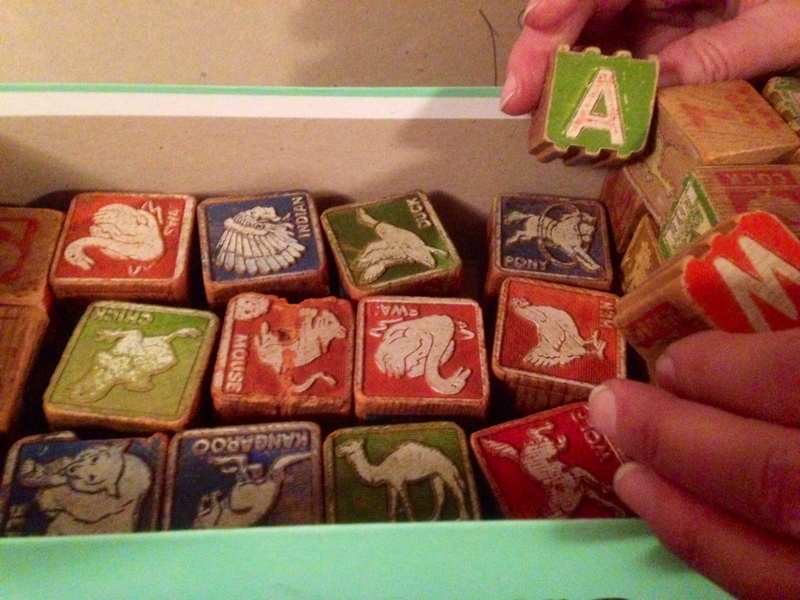 Mother kept these oblong & round beads and animal-themed alphabet blocks for her grandchildren and great-grands. These sturdy toys entertained children of mothers they nurtured in their ministry for New Life for Girls too. 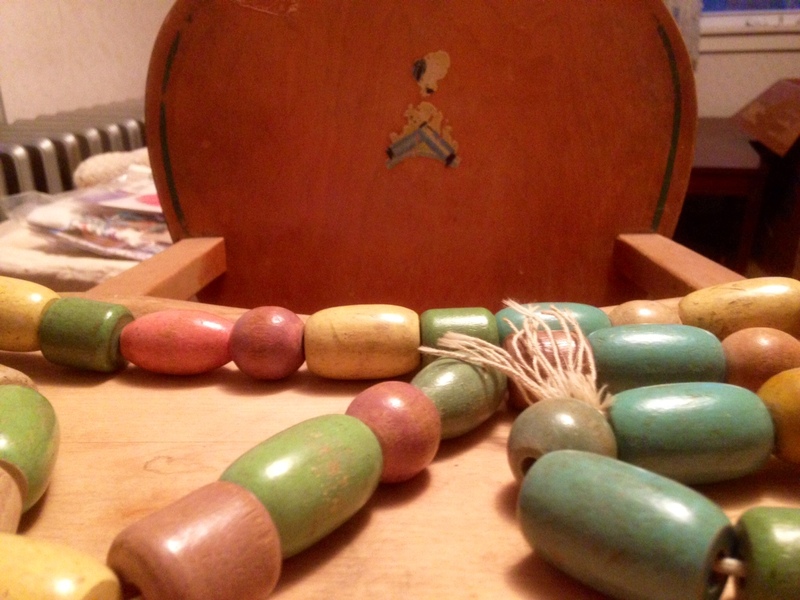 All of Mother’s children and many of her grandchildren sat on this high chair and played with these wooden beads and blocks. We never played with plastic toys. To me, such simple toys bespeak innocence and the charm of a simpler life..
On this Mother’s Day 2016, these artifacts seem an apt metaphor for my mother’s contribution to our heritage. “Outen the light,” meaning turn off the light switch to conserve energy. “Ach, don’t talk so dumb,” spoken as a way to discourage silly talk. I paid attention, of course, and rushed out wearing my blue wool coat and pink and white polka-dotted bandanna on my head, eager to help Grandma set the table. In cool weather, I always had my “head tied shut,” an expression Mother used to keep us from getting a cold, she thought. But looking back, I think having my head tied shut is a metaphor for keeping out the world and all the corruption that can come in through an unlocked door, even a passageway like my ears. Tied a nickel into the corner of a square, white hanky to teach me to give to God. 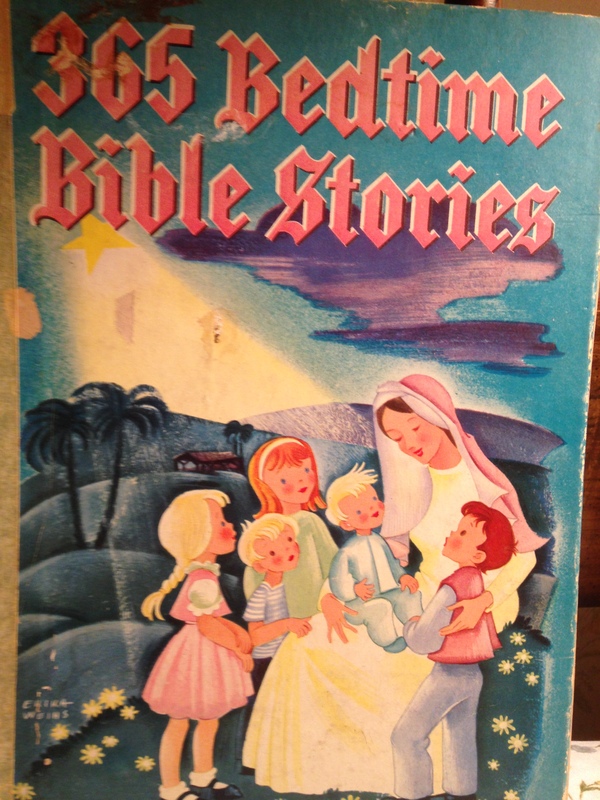 Read to me from a Bible Story Book, one story for every day of the year. The date on the flyleaf, MCMXLII, can be translated as 1942. In the years following, my sisters Janice and Jean and my brother Mark must have heard these stories too. 4. Led us in prayers of gratitude before all our meals. Usually, the prayers were silent. My mother wasn’t perfect. Whose is? She had moments of impatience, she sometimes complained, yet she did the best she could. I choose to celebrate those attributes of a woman who all her life sought to please God. An invitation to you: Add words of wisdom or silliness from any source, including your mother. Good morning, Marian! That is so cool that you still have those wooden toys that you played with as a child. Try 2 – Deference in our patriarchal society? Thanks Marian this was fun! Oh, Susan, as I read your expressions I thought of another one: “Clean up your plate,” usually followed by the thought of starving children in China. The one about “faces and wind blowing” is new to me, but I remember the tale of a child who pouted and her/his face froze into a forever frown. Glad this post evoked so many memories for you. “A nice hot bath will cure all your problems, ” what will be will be”, “this too shall pass”, “clean your plate, think of all the poor starving children in China”…just a few Mom-isms that I find myself saying. Lovely post, Marian. Your photos and memories are priceless. Have a wonderful Mother’s Day! Well, some of my blog posts have become scenes for my memoir chapters, but I think you are suggesting something different, worth considering. Thanks, Kathy! It’s interesting to me how flexible dates are for holidays around the world. Canada, for example, celebrates Thanksgiving in October in contrast to November in the USA. Wherever you are in your travels, Fatima, it’s always nice to meet here. Thank you! I did enjoy reading your tribute to your mother-in-law Edith, posted before I knew you. And I love how you tease out what’s under the obvious, paying homage to “the fleeting arts–the art of rearing children, cleaning a house, gardening, sewing, making fabulous meals, volunteering in church and community,” true of so many women of that era. Now also I know where grandson Owen’s name originates! Mother said “Ach” often. In fact, your mention prompted me to go back and add it to # 2 where it definitely belongs. See your influence, Shirley! I imagine your suitcase (Mom always called it suity-case) is packed and ready for flight. Happy travels, safe landings. We await your reflections later. Hope you have a happy mothers day. Yes my children grandchildren and great-grandmother enjoyed the wooden toys. Actually my son Peter asked who got the wooden toys they loved them. I was so surprised when we visit mom in April prior to her passing that my grandchildren loved being there. Actually loved the simple quiet life so much that they asked why can’t we live here. It’s is great memories of love and security. Mom would always tell me this to shall pass. I now say it to my children when their in pain and distressed. Great post. Leaving this weekend to Nikko’s graduation my children coming too. Mothers day at Nikko’s. Yes great blessings. Happy Mother’s Day – you have such close family ties – and in more than one direction.I’m glad you remember the love, security and peacefulness on Anchor Road. The house has been sold – again! Thanks for the laugh. Algebra was a mystery language to me too. I even took Trig which was even stranger. Women of letters don’t often relate to numbers well. 🙂 I agree with your mother though – something I have been straining to remember comes in a flash when I’m doing something else or when I wake up the next morning. Wise women, our mothers!
. . . unlike “The Velveteen Rabbit” who became real. Ha! I remember those old wooden toys; no plastic legos back then! Another favorite was the wooden marble chute – and, of course, pickup sticks and jacks. Yes, we had a wooden marble “roller,” we called it, which has since found a home with my niece who has four children. Thanks for adding to the stash of sayings here. Yes, I did catch the wry tone in the last one. Thanks for reading and commenting, Helena. Wouldn’t your girls have fun playing with these old timey toys – they’d probably recognize them as quaint as you do. Thanks for dropping by, Angel! My German great-grandmother used to say, before every meal (evidently thinking she was “translating” the German Guten Appetit into English) “Make out your meal.” Sometimes one of us will still say it, in memory of her. How sweet! Probably the work “make” has a wide spectrum of meanings in German as it does in other languages. Your great grandmother’s saying is both funny and touching. Several generations of Longeneckers have taken to singing the Doxology before a holiday meal in Grandma’s honor. I hope you are doing well, Tracy. Thanks for commenting here. Thanks, Marylin. It’s nice to hear your fresh perspective. My mom’s now 86 and I’m still hearing these from time to time! Janet, your book could be called Sisters-in-Love, Mom Re-invented (or the reverse). Sister Wives is already taken. I love your mom’s droll sense of humor, which you obviously inherited. Oh, Marian, all of the expressions were familiarly humorous to me…except the last. “Tie your head shut” still has me smiling. My grandmother was Pennsylvania Dutch Brethren, and her expressions were charming and practical. I wish she were still alive–and my mom could still understand–I think they would both love this entire post and would smile and nod their heads in agreement. Grandma had a sweet prayer she sang in German at night when the cousins and I visited, but all four of my girl cousins have different interpretations of the meaning. However, we all agree it was tender, loving and protective. My Grandma had a similar song, and I went to Google Translate and Bing to try to piece together a facsimile. It started of with what sounded like “Zsu, Zsu” (an enigma) but went on to say something like “Sleep little love in heavenly peace” – “Wenig Liebe in himmlischer Ruhe schlafen.” I’m missing the mark here, but I hope you get the idea. Sitting on her lap, I heard the comforting words, and felt protected and loved as you say. Your forebears and mine sound like the same people with slightly different labels, yours Pa Dutch Brethren and mine PA Dutch Mennonite. I don’t belive any mother is perfect unless her name is Mary Poppins 😊 My mum had two saying when I was a youth ‘ Don’t forget your cardigan ‘ I hated cardigans I never put one on when she told me . Now I wear layers , hence , a cardigan plus I live 10 miles away from a town in Wales called Cardigan …beautiful it is too . “Mum was right,” your stories seem to say, even if you discovered the sense of her wisdom years later. We just don’t like to admit it. Thanks for the chirpy story and your unique slant to things. Happy Mother’s Day to you too. I picture you in a sun hat today, Cherry. Do we ever – love to visit, that is! This summer we are moving house, so it would have to be in a year or two at the earliest. I know you will do well with this venture. I do remember a string of beads like that. As for Mom sayings, we have a name for them: “Berthaisms.” Mom’s name is Bertha (oh how she’s always disliked that name) and they are as classic and in-house-joke funny as they come. I have a file of them somewhere. Maybe I’ll dig them out sometime for a blog post. Hope you have a wonderful Mother’s Day weekend. Oh, Melodie, I had great aunt named Bertha; that must have been the “Brittany” name choice of a bygone era. I’d love to read a blog post of Berthaisms. When I left my rural Mennonite community in Lancaster County for Charlotte, NC I came up with Marian-isms, according to my sophisticated roommates at the time. Though I had a college degree and into my 4th year of teaching, I was woefully naive and unsophisticated, a sheltered Mennonite. I remember feeling embarrassed, but I can’t recall a single one. Ha! What wonderful sayings! I love ‘Tie your head shut’! I wonder whether there’s a Swedish equivalent of that saying – ha! It’s wonderful that you have such wonderful childhood memories of your mother, Not all of us do. Certain sayings stick in my mind my mother used to say, nowhere as endearing as your mother’s. Like if I asked a question about something being talked about in front of me, but I wasn’t invited into the conversation, I’d get: “Children should be seen and not heard.” Touching, I know, not really. Tucked near the end I remarked that my mother was perfect; however, she didn’t belittle us, so harmful to one’s self-esteem. You have chosen to make lemonade out of your proverbial lemons, all the more remarkable because of what you have had to overcome. Brava, Debby! Every high-achieving woman like you has had one or more strong mentors in her life. Anyway, that’s what I have observed, and I think there is research to prove it. Great “talking” to you, Debby! I played with blocks similar to those. My grandma also had wooden beads, but I think they were smaller. I still have a book called Manly Manners plus a few books of nursery rhymes. The British looking boy in Manly Manners knew it was wise to pick up all toys (and wash all dishes and clear tables) before bed. I still follow that advice. My mother taught me that education was more important than anything. To her, education was about getting ahead in the world. I now know there could have been a little emphasis on the education of the soul. For that, I turned to my Paternal Grandma who taught me to love spiritual music and the community gatherings for service and shared picnics at the country Presbyterian Church. She also grew vegetables and fruit and tended the hens with an air of reverence. 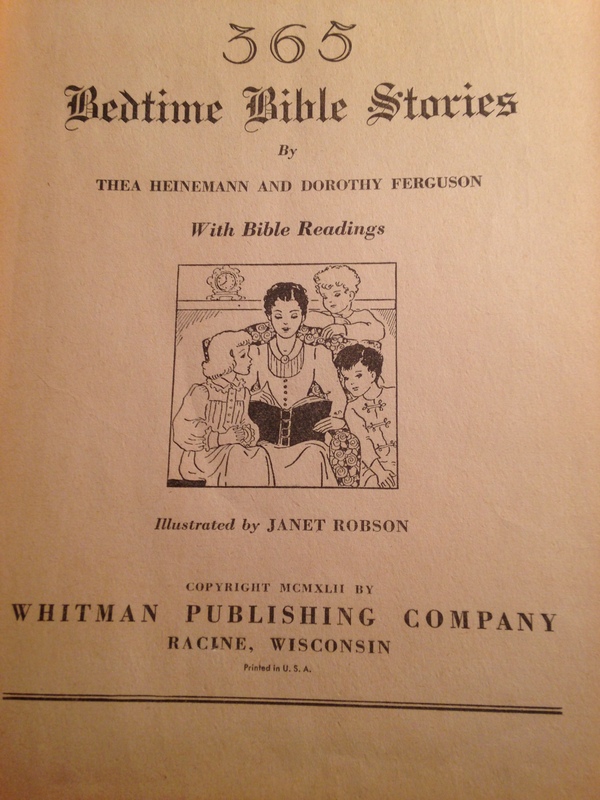 And prayers before meals and before bed at Grandma’s house. As you review your heritage, it strikes me that you have been given all the tools for a rich life. I can see why you approach everything you do with an air of reverence. Your comment about the Manly Manners book reminds me of another of Mother’s truisms: If your beds are made and dishes washed, your house’ll look pretty good. More great memories of your dear mother. Mom said many of the same things, also “Who do you think you are?” I just Skyped with my mom in Canada and it makes me realize how lucky I am to still have her around. I hope you had a wonderful Mother’s Day. It was celebrated here in Spain last Sunday. Mother’s Day celebrations appear to be feasts with moveable dates around the world. Yes, you are fortunate to still have your dear mum, and I know you realize it. Hope your day was blessed too. I had wooden blocks and beads too. They’re so much more tactile than plastic I think. My mother’s words of wisdom were, amongst others, don’t follow the herd and try to be like everyone else. Obviously, I took those to heart. Yes, you did. I wonder if she set an example for you in fitness, walking especially. I admire your ambitious goals – yours and Commando’s as well.